The best walk in the Great Glen! Towards the south end of Scotland’s Great Glen, the passing tourists stop in the thousands every year to look up at a statue, a group of three figures. This is, of course, the Famous Commando Memorial. It recalls the efforts and sacrifices made during World War II by this elite band of soldiers. The monument is a creation of great presence and effectiveness, completely in keeping with the scale of the panorama it overlooks - the very training ground of these men. Observe the visitors of all nationalities. They spill out of tour buses or cars, walk the short way to the base, take photographs all around, read the inscriptions, then turn and depart. But there’s more here than meets the eye. Panorama with the Commando Memorial on the far left. The dignity and sheer presence of the three figures of the Commando Memorial make quite an impression on visitors. A Great Glen Must See. Probably less than one in a hundred visitors even spot the signpost that lies beyond the carpark, and a few paces away to the west of the main monument. This points to a well-made path that leads to the scene of an earlier conflict - at a place that now stands only as a ruin half-hidden by trees. If you have an hour or two to spare the High Bridge is a Great Glen must see. And, if you are a regular reader of this site, you know we aren’t the biggest fans of this coast-to-coast through-way: the Great Glen connecting Fort William and Inverness. A reliable Rabbie’s small guided tour coach (taking groups of 16 or less) calls at the Commando Memorial. Let’s do a great Scottish walk! 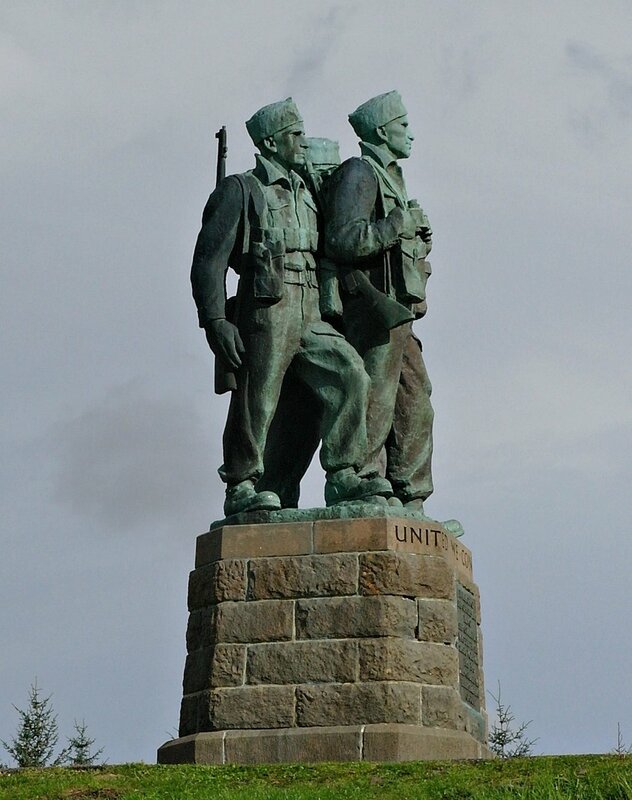 Look for the signpost on the west side of the Commando Memorial carpark, by the B8004 road. We are going to see the High Bridge, which some maps and signposts is ‘Highbridge’. The walkway then changes direction and comes back eastward again. You soon arrive at the trackbed of a long-vanished railway. On the path of the best walk in the Great Glen? Certainly one of the most rewarding, with great views and historic interest - yet so many visitors just drive past on the main road, the A82 at Spean Bridge. Follow the line of the track west, with the hollow rumble of a rocky river bed heard nearby, through the oaks and birch trees. Suddenly you’re there. There’s an information board and you’ll find yourself looking down on an arch and the broken piers of a roadway. This is the High Bridge. At one time this three arched but now ruined bridge had an inscription on it reading "In the ninth year of His Majesty King George II this bridge was erected under the care of Lt General Wade, Commander in Chief of all Forces in North Britain, 1736." An early example of the use of North Britain to mean Scotland. So what was the High Bridge? 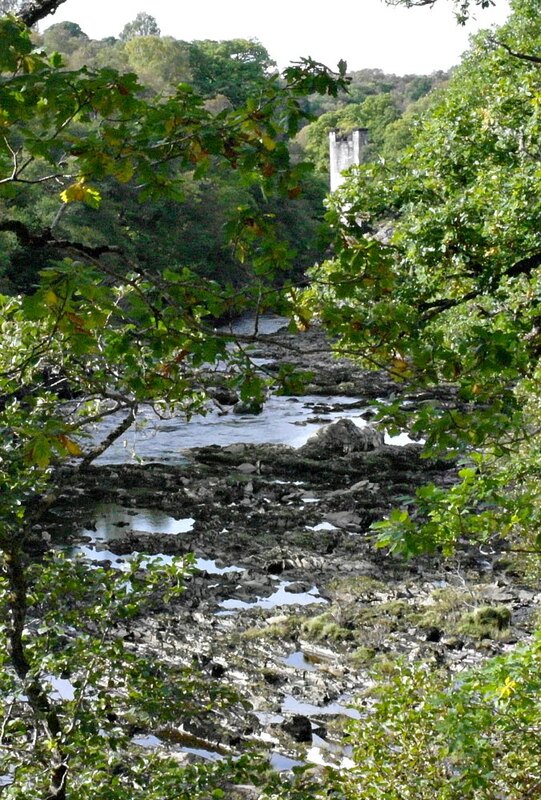 It was the tallest bridge amongst those built as part of the network of military roads - ‘Wade’s Roads’ - created to aid the movement of troops in the garrisoning of the Highlands back in the 18th century. (The government in far-off Westminster, London, England, had been nervous for decades, considering the Highlands to be a potential source of armed clansmen sympathetic to a certain cause.) The bridge was completed in 1737. Why is the High Bridge important? Pay attention! Do not examine this bridge too closely. Prince Charles Edward Stuart (our very own Bonnie Prince Charlie) wanted to restore the Catholic Stuart monarchy and become king, taking it from the Protestant House of Hanover line of monarchs. This aim found much sympathy and support in Catholic countries such as France and Spain. The Prince arrived in Scotland, looking for support, in 1745. His campaign - a civil war - ended at the Battle of Culloden in the following year, famously the last battle fought on Scottish (or English) soil. The last Jacobite uprising is often known as ‘The ‘45’ to distinguish it from earlier attempts to seize the throne. As soon as news reached the clans that this claimant to the throne was in Scotland, some of them took Charles’ side. Others supported the government. In the Great Glen, amongst others, the MacDonalds (Macdonnells) of Keppoch were sympathetic. Imagine the scene. The Prince is coming in from the west. (He’s about to sail up Loch Shiel to rally the clans at Glenfinnan.) The man on the ground with authority is Alexander Macdonnell of Keppoch. Anyway, Scotland is buzzing. Government troops are given hurried marching orders to quell the threat of Highland insurrection. This particular army group needs to travel 25 miles to bolster the garrison at Fort William. And they have to do it in one day as the countryside is hostile. Apart from the officers - two captains - the squad on the march is new to the army and nervous. On the Prince's side and wasting no time, Alexander Macdonnell sends his cousin Donald Macdonnell of Tirnadris to the strategically important High Bridge. Donald gathers eleven men and a piper and they all arrive at the south end of the bridge. In those days it was overlooked by an inn, where the clansmen gather. On comes the government military company from the north, down to the crossing place. The Macdonnell piper strikes up his pipes, while the rest of the opposing Highlanders dart around the inn and through the trees nearby, yelling and making lots of noise and giving the impression they are a much bigger force. This is enough for Captain Scott and his timid crew. They all retreat back up the glen. The clansmen open fire and Scott forms his men into a moving hollow square on the road. The Macdonnells leave cover and, now reinforced by more clansmen, cautiously pursue the retreating government forces. Long story, more shots are fired, and the whole affair then becomes a total shambles for this particular squad of the (ahem) British Army. Read about it in this excellent piece from the 1745 Association website. You can read some of this too on the information board on the trackbed by the bridge. The site is quite difficult to photograph in summer, because of the foliage, but when you’ve taken the pics you want and enjoyed the sylvan setting continue on your way along the former railway. Old railway trackbeds are always good to walk on because the gradients are always easy! Like a relic of a lost civilization, one of the piers of the viaduct that once carried the Fort Augustus railway rises out of the woodlands by the River Spean. The piers were cast in concrete, like the almost contemporaneous but all-concrete and much more famous viaduct at Glenfinnan. This particular one connected Spean Bridge (and thus Fort William) to Fort Augustus, further up the Great Glen. It was originally conceived with the intention of running all the way to Inverness - and what a trip that would have been! Imagine looking for the Loch Ness Monster from the comfort of a railway carriage. Instead, the ill-fated Fort Augustus railway became a prototype for a failed venture, encountering financial difficulties and also legal obstructions. The Highland Railway had already ensconced itself in the Highland capital via Perth and Aviemore and did not want another line approaching Inverness from the south. The last passengers travelled this way in 1933. Then your path rises gently across the moor and scattered woods. Pick yourself a bit of bog myrtle, there’s plenty of it hereabouts - and it is said to help keep midges away. Soon you’re on the noisy main road to walk back uphill on a pavement to the Commando Memorial. Almost back at the starting point of the walk, at the Commando Memorial. Reflect as you go that, outside Inverness, the Culloden Battlefield is a major visitor attraction, operated by the National Trust of Scotland. There - if you haven’t already - you can learn all about the Jacobites who supported the hot-headed Prince and his futile cause. It’s a great visit if you want to understand Scotland’s past. The easy walk to the north side of the High Bridge as described is just a great way to get to known Highland landscape and history. Yet, compared to the end of the last Jacobite rebellion - on a sleety moor outside Inverness in 1746 - the events here on the military road across the River Spean, where the ‘45 started, seem half-forgotten. The 1745 Association Cairn on the south side of the river at highbridge. No parking place, then rotting duckboards, fallen trees. You could certainly say the short excursion through the undergrowth on this side has plenty of atmosphere! You’ll certainly get this impression if you want to take a look at the ruins of the High Bridge from the south side. (It’s signed ‘Highbridge’ from the main road south of Spean Bridge.) You’ll find nowhere to park, though the spot is marked on the roadside by a cairn erected as recently as 1994 by the 1745 Association. Scramble down to the bridge from the cairn at your peril! There once were duckboards, now in a treacherous state. The military road down to the bridge is all but blocked with fallen trees. It’s a neglected historic site - a long way from the ‘razzmatazz’ of the visitor centre at Culloden!